Wear a tie with a formal, perfect knot every day when you have one of Clip-OnTies.com's clip on neckties! 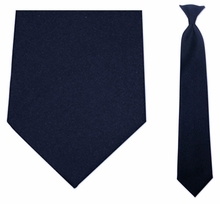 Make wearing a uniform even easier with one of our easy to match, ready to wear tie. Our solid black and blue clip-on ties are made of easy-care polyester, so it can keep up with the day to day use. These clip-on neckties are also great for schools requiring students to wear uniforms. Our uniform ties are a durable and perfect touch! Traditional ties can be a hazard for security work, but also for children who have to wear ties. Each of our clip on ties for men and children has a break away feature, which is a requirement in many uniform ties. When purchasing, you can rest assured that you are safe. 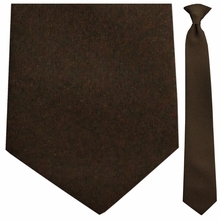 Additionally, every ready to wear tie comes in three sizes, so you can find the best one for you! Check out our selection below and feel free to contact us for more colors and large orders!